The more that trees and plants are studied, the more scientist find out that there's much more to learn. They do us a lot of good, you know. Praise should be given to the Creator, not to evolution. Did you know that coconuts float? One of those things I didn't know until recently. Okay. 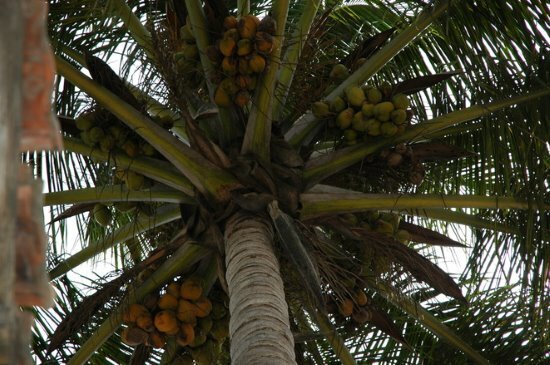 Did you know that structure of coconuts is being studied in a biomimetics effort to make building more sturdy during earthquakes? When you branch out with your studying, we can see that trees and other plants — well, there's a wagon train load of things we didn't know about plants. Trees seem to be able to grow out of some unlikely places, including what looks like solid rock. They have nutrient foraging strategies. Another function of trees is water transport, especially of snowmelt. Plants have complex chemical activities going on, including that good ol' photosynthesis. Evolutionists don't understand much about that and other things plants do (and admit as much), yet they commence to bowing down to Darwin, ignoring the amazing specified complexities, and refusing to give credit to the Creator. Yet evolutionism has nothing to do with what is observed, nor can it explain what's happening, why, or how. You don’t have to be a proverbial tree-hugger to love trees and wonder at all the things they can do, and do for us. India just broke a world record by planting 50 million trees in one day, National Geographic reported. Wow! Other countries are on the tree-planting binge, too. Why would people do such a thing? “Trees sequester carbon dioxide from the air, thereby reducing the amount of greenhouse gases in the atmosphere,” but they provide many other benefits, too. Besides, they are wonders of engineering in their own right, and often beautiful. To read the rest and get to the root of the excerpted article, click on "For the Love of Trees".